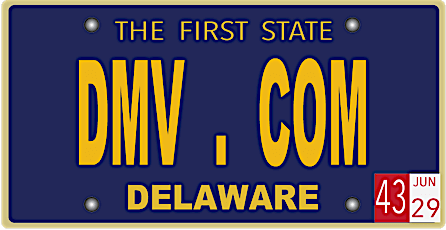 DMV.com was created to help simplify your life by providing you with all the vehicle related information and Delaware DMV services you may need, in one place. Quickly find information and services regarding driving records, vehicle registration, drivers license renewal, license plate renewal, getting a learners permit, and finding a Delaware Department of Motor Vehicles approved traffic school. To obtain a drivers license in Delaware, prospective drivers must meet DMV guidelines. Learn about new drivers license applications in DE. Obtaining a DMV driving record in Delaware is easy when you order online. Request a driving record from home to avoid waiting at the DMV. The DMV requires auto insurance coverage for all cars registered in Delaware. Find low cost auto insurance from our online insurance center. Enroll in an online aggressive driving course approved by the state. This online driving course satisfies Delaware DMV traffic school requirements. Take a DE DMV practice exam online to test your knowledge. Passing a DMV practice test before applying for a license saves time and money. Find DE car registration information to help with new registration, renewal and more. Learn how to get car registration papers from the DMV. Delaware drivers education is mandatory for prospective drivers younger than 18. Discover DMV rules for drivers ed, and learn how to enroll. Learn how to get a DE car title bill of sale from the DMV when buying or selling a car. A bill of sale records a transfer of car ownership. Failing to pay traffic tickets in Delaware can lead to penalties from the DMV. Learn how to pay a ticket online to avoid these consequences. The Delaware DMV considers driving under the influence (DUI) a serious offense. Get up-to-date DUI information, including DE DUI laws. Find out how buying a car online makes it easy to meet Delaware DMV new vehicle requirements. Learn more before you purchase a car in DE. Obtain DMV services at DMV locations throughout Delaware. Get DE DMV contact information and hours to help you make an appointment. DMV.com has easy guides for drivers license, vehicle registration, license plate, emissions and other motor vehicle issues online. Our site spares you from all DMV’s bureaucracy. You’ve just visited the most reliable and easy-to-use guide to the Delaware Division of Motor Vehicles. DMV.com is your fastest and easiest guide to the Delaware Division of Motor Vehicles! Here you’ll find all the info you need in an easy-to-understand format in just few seconds. Our informative articles will break it all down for you, from the specifics at the Delaware DMV, car driving and ownership, getting your DE driver’s license, to vehicle registration and auto insurance. Navigating around our site is easy. You can use the “search” feature or the navigation sections to help you find exactly what you are looking for about the Delaware BMV. We encourage you to interact with us and speak your mind. Follow us on Facebook and help us be even better in offering the most-up-to date info in the fastest way possible. Because we’re a privately owned website that is not affiliated with any government agency, we spare you from all unnecessary government bureaucracy. Dealing with the requirements set by Alaska BMV has never been easier.